The global pharmaceutical hot melt extrusion market is highly fragmented with several small and medium-scale companies competing against each other and with large players, notes Transparency Market Research (TMR). However, the market is dominated by few large players—Leistritz AG, Xtrutech Ltd., Milacron Holdings Corp., Gabler GmbH & Co. KG, and Coperion GmbH. In the coming years, the market is anticipated to witness intense rivalry between the top players, finds TMR. The major players are expected to make substantial investment in R&D activities to develop high-end and innovative products to consolidate their market shares over the forecast period. 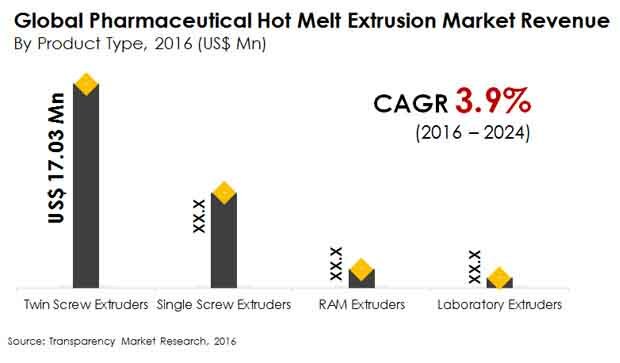 The global pharmaceutical hot melt extrusion market stood at US$26.6 mn in 2015 and is expected to expand at a CAGR of over 4.7%, measured in terms of volume. The market is anticipated to rise at 3.90% CAGR from 2016 to 2024 to attain a value of US$36.4 mn by the end of the forecast period. Based on geography, the global pharmaceutical hot melt extrusion market is segmented into Asia Pacific, North America, Europe, the Middle East and Africa, and Latin America. Of these, North America led the global market with a major share of about 38% in the year 2015 and, the regional market is expected to maintain its lead over the forecast period. The impressive growth will be fueled by the presence of a large number of established companies, particularly in countries such as the U.S.
On the basis of the type of products, the global market is segmented into single screw extruder, twin screw extruder, laboratory extruder, and RAM extruder. Of these, the market is anticipated to witness substantial demand for twin screw extruders. The segment is expected to be a major revenue contributor over the coming years. The extensive demand is attributed to the increased flexibility of twin screw extruders in mixing, compounding, and reacting various polymeric materials. The hot melt extrusion is gaining increasing popularity over other conventional extrusion techniques due to numerous benefits and the enormous flexibility with the extrudates. The operating parameters in the hot melt extrusion process can be conveniently changed as per the requirements and agitator designs can be easily customized for a particular application. In addition, the increasing flexibility with extrudates to produce polymer products with varying shapes and uniform density has stimulated the demand for hot melt extrusion process in pharmaceutical manufacturing. However, the increasing concerns related to the non-compliance of various regulatory requirements is likely to impede the market to an extent. In addition, in some instances, the infeasibility of mixing active pharmaceutical ingredients (APIs) with polymers to prepare medical devices has restricted its use. Be that as it may, constant advancement in manufacturing technologies leading to significant improvement in bioavailability of the API formulations are expected to create promising opportunities for market players in the coming years.